Have us drill your next well today! Island Pump & Tank's team of experienced drillers and project managers will work with you to select the right equipment, personnel, and price for any job. We can even provide a geologist if you need us to collect samples. Our equipment is versatile, ranging from the low profile GeoProbe 6620 to the powerful Diedrich D-50 Drill Rig. Whether it's drilling a test boring in the basement of an office building or blasting through rock to set a deep well, Island Pump & Tank's drill team will get the job done safely and professionally. Our drillers are highly trained craftsmen. You will not find a more decorated group of contractors. 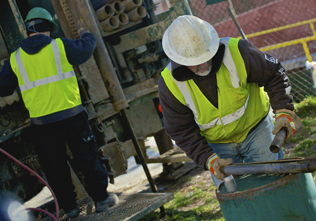 Our drillers have Master Driller certifications, NYS Well Drillers certification, OSHA HAZWOPPER training, LPS training, LIRR Track training, and manufacturer’s operator certifications. We are licensed in New York and New Jersey. Being a Master Driller doesn’t make you a professional. We expect professional attitude, safety, and good housekeeping out of all our employees on all of our job sites. It’s about delivering the whole package. • What is Direct Push (DP) Technology? • How does a Geoprobe® Machine Work? • What is in situ and ex situ analysis? • What are discrete and non-discrete soil samplers? • What are groundwater grab samplers? • What Sets Geoprobe® Systems Apart?